NHK's 2012 historical drama is titled "Taira no Kiyomori" after the 12th century general & politician of the same name. Taira no Kiyomori (1118–1181) was born as the first son of Taira no Tadamori (head of the Taira clan). During his youth, Kiyomori help clear the sea of pirates in the area of Seto and then helped break down the noble system to build up a samurai-dominated period. Through the Hogen Rebellion (July 28-August 16, 1156), Taira no Kiyomori gained the trust of Emperor Go-Shirakawa. He then used this trust to eventually attain the position of Daijō Daijin (chief minister of the government). Filming begins August 18, 2011 and will take place in Kyoto, Iwata, & Hiroshima, Japan. Sayuri May 23 2017 1:36 pm It makes me happy this got a drama. Yoshitsune is another level of legend in Japan but Kiyomori is a more realistic "legend" in terms of all the things he tried to do to improve Japan's trade links and economy with China and Korea in a time when the courtiers thought anything from outside Kyoto was foreign and probably demonic. It's also nice when they make a drama about actual warriors who actually fought for stuff, rather than most of the the Edo period 'warrior' who lives in a mostly peaceful society and gets into brawls and scraps rather than anything meaningful. My one complaint in this drama is that Yoritomo is shown as being some amazing warrior from an early age when he wasn't one. He never won a battle in the field, he got others to do that instead. He's also portrayed much too nicely in this series. Yoritomo is credited for revolutionising government in Japan, but what he actually did was launch a rebellion for personal gain which lasted five years, had killed most of the people who helped him win it because they were better warriors than he was, then died and left his sons to kill each other until in the end the ones who made the govt he started successful were actually Taira. I really don't think he should be narrating like he's a hero figure. He's really not. Stephanie Francia Jun 07 2014 5:46 am Could someone add the rating chart, please? Maggie Mayer Aug 18 2013 12:35 pm There was a movie made some years ago with Takahashi Ezo or Azo. Can you tell me where this actor who played Kiyomori? Gothamazon Sep 08 2012 7:43 am I love this series! As many of you, I've watched the first 5 episodes with English sub. I want to watch the rest of them. Particularly to hear Okada Masaki's narration and his role as Yoritomo; tho other cast are also amazing to watch! Petra Keller May 15 2012 12:52 pm I 've watched all 5 episodes, the 6th one is still in the raw. the passion displayed by Japanese actors in Japanese historical dramas is next to none, I have not seen any of this passion in their modern dramas. 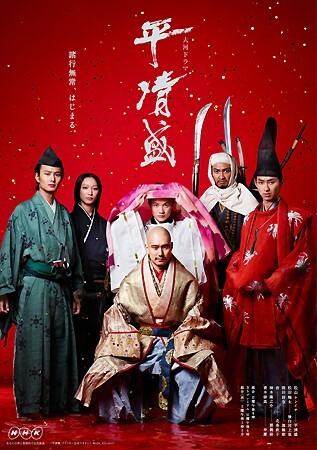 One can clearly follow how the History of Japan unfolds by watching these dramas. It's not so much about pagantry or the actors, it's about educating Japanese people and the world about what happened way back when and how these events led by sequences to the modern Japan as we know it. To understand a culture one needs to be an avid student of history to know what consequential behaviors shaped Japan to become what it is today. Linda Mar 19 2012 7:07 pm Another great Taiga drama. I never miss these wonderful historical dramas. Great story, powerful performances, gorgeous music with stunning locations. Everything one needs to create a masterpiece, which is what these Taiga dramas are. Don't ever miss them! t-berry Mar 07 2012 9:13 am great drama..i've already hooked and now have to wait for a year to finished..my beloved matsuken,arata, tamaki,shunsuke and masaki okada is here!!! Lynn Feb 23 2012 3:21 pm I hope people will leave any comments worth responding to. Lynn Feb 23 2012 3:18 pm I watched the first 2 episodes in Hawaii on Kiku T.V. The episodes were great and am looking forward to the rest of the programs. Looking at the historical view of the Heike and Genji families and their interaction with the imperial families. ka-ki Jan 25 2012 6:32 am what a cast this is packed with great actors and I'll gladly label them : Matsuyama Kenichi, Daito Shunsuke, Okada Masaki && Tamaki Hiroshi 'Wow' right? Dorama Dec 30 2011 7:08 am Please please please show this somewhere! I really want to watch this drama. Seul-Gi Sam Aug 09 2011 12:56 am woooooooooooooow!!! I want to see the behind the scenes of their filming. kekeke~ :DD Look, I hope Kenichi & the whole casts will enjoy their filming despite of a hot weather these days. ^^ Have a happy summer, guys!!! !